I’ve heard it said that we make friends for a reason, a season or a lifetime. Then I suppose it makes sense that the friends we made for the season of raising our kids are going their own way now and perhaps leaving us feeling isolated. In high irony, although we seem more connected than we ever have with our phones, tablets and computers we are, in fact, lonelier than ever. AARP estimated that, “42.6 million Americans over the age of 45 suffer from chronic loneliness, which significantly raises their risk for premature death…” Clearly, adult friendships are more important than ever. From my non-scientific anecdotal observations, as the nest empties, people feel that their social circles begin to contract. The children have graduated from high school and its attendant activities. Gone are the casual relationships you struck up with other parents on the sidelines of any number of kid-related activities. We wonder if we are anomalous or if everyone at this stage of life is swimming in the same waters. 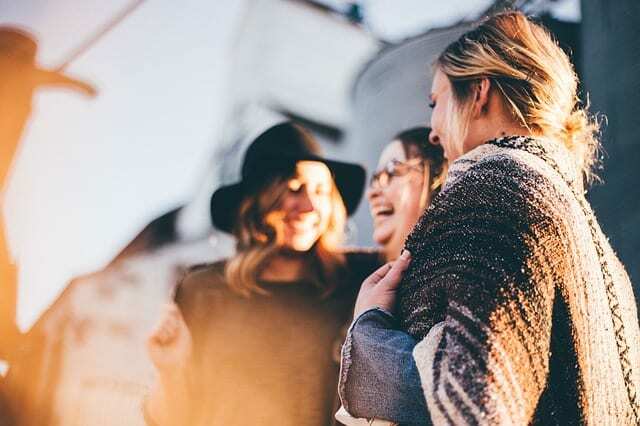 Maintaining relationships becomes more challenging but we long for connection and we know that friendships buffer us from many of life’s blows, with quality friendships adding years to your lives. So, once our children are gone, how do we go about making and keeping friends? Here are some suggestions. 1. Be a friend. Invite people over for a meal, potluck dinner or just for coffee. Entertaining is a fabulous way to spend time with people and to get to know them better. It can be hard to put yourself out there and risk being rejected but the payoff is well worth the risk. 2. Reconnect. You probably had friends from before you had kids who you have lost touch with. They may be feeling exactly as you are. Take the first step, by reaching out to them. Most people love to catch up with an old friend. If nothing comes of it than so be it, but you never know when a terrific old friend can become a fabulous new friend. 3. Say yes more often than no. You don’t have to accept all invitations but even if you are not sure you feel like going out, say yes. We all make plans and then think longingly of how great it would be to relax at home instead, but once you make the effort, it’s usually worthwhile. If you can’t say yes, suggest an alternative. Continuously rejecting people is not going to serve your purposes but by suggesting an alternative date you are conveying that you can’t make it this time but you really do want to do something at some point. 4. Cultivate a hobby. Five years ago, I would have told you that there was absolutely no chance I would ever play a card/tile/board game. It seemed so cliché to me but learning how to play a game like canasta or mah jong gives you a great opportunity to bond with a group. If you have a standing weekly game, it releases you from the pressure of having to make plans to see people and it guarantees you at least one social experience every week. 5. Be a joiner. There are any number of organizations that need your help, so volunteer your time. If you’re feeling less altruistic, you can join a group (book group, knitting circle) that might catch your fancy. If you can’t find a group you would like to join, fashion an empty nester group just as you might have started a baby group once upon a time. Find a few people who are also struggling with their new status, and begin by meeting them once a month just to chit-chat. 6. Be a lifelong learner. Take a class and learn something that interests you: cooking, bible, calculus, science or something totally obscure. Keep your mind engaged and meet people with similar interests. 7. Exercise/Adult Sports. Routine is an excellent way to meet people and consistency is a great way to keep them, not to mention that exercise is just good for your body and your mind. Take the same exercise class every day and you’ll find you run into the same people over and over which is the perfect recipe for making friendships. Or participate on an adult team sport which is another great way to meet people. 8. Travel. There are group tours to all parts of the world. Take a tour with people from your area and you will certainly get to know them. And remember, as with most human conditions, the fact that you feel lonely and somewhat unmoored probably means that many other wonderful people out there share that feeling. Be proactive in finding your own solution. Remember, “Strangers are just friends we have not yet met,” so get out there and meet them. Mom Friends: Is It All About The Kids?